David Pope is a script consultant, screenwriter, and training provider working internationally. David is the annual consultant / moderator for the Rotterdam Lab at CineMart and co-founder of Stowe Story Labs in the United States. He is currently creative consultant for The Royal Film Commission - Jordan on the Rawi Screenwriting Lab and has been selected as a Screen Consultancy Expert in script consultancy supporting companies on the FOCUS scheme, supported by Creative Scotland and Scottish Enterprise. David recently consulted on a slate of five feature film projects for On-Screen Manitoba and Manitoba Film & Music Funds through Script Angel. In addition David has consulted for Arts Council Malta's KulturaTV fund since it's inception. David has worked as script consultant on single projects and slates in North America, Europe, Middle East. North Africa and Asia including work with Academy Award and BAFTA nominated producers and screenwriters and national film funds. As a screenwriter David recently completed writing to commission the latest draft of the European co-production TEMPELHOF and has been commissioned to write the international co-production RULIN. David is the director of advance films with whom he has slate of projects. Currently in development are feature films THE BELONGING and LITTLE DOORS and television dramas RECONSTRUCTION and UNMARKED. Directing credits include the award-winning feature film MILES FROM NOWHERE. BFI, UK Film Council, BBC, BAFTA, National Theatre, British Council, Creative Europe, Creative Scotland, Creative Media Skills, Royal Film Commission – Jordan, Rawi Screenwriting Lab, Warp Films, Allfilm, Wajda School, Edinburgh International Film Festival, BFI London Film Festival, Polish Film Institute, Media Business School, Cannes Film Festival, Film London, Lionhead Studios, Xingu Films, Irish Film Board, FAS Screen Training Ireland, Filmbase, MEDIA, Jameson Dublin International Film Festival, New Horizons Studio, Estonian Film Institute, Arts Council Malta, London Film Academy, Cannes Cinefondation and London University amongst many others. 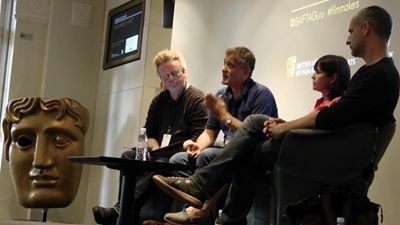 Chairing panel on script development with producers for BAFTA. London UK.